A pulsar is basically a rapidly spinning neutron star. A neutron star is the highly compacted core of a dead star, left behind in a supernova explosion. This neutron star has a powerful magnetic field. In fact, this magnetic field is about one trillion times as powerful as the magnetic field of the Earth. The magnetic field causes the neutron star to emit strong radio waves and radioactive particles from its north and south poles. These particles can include a variety of radiation, including visible light. Pulsars that emit powerful gamma rays are known as gamma ray pulsars. 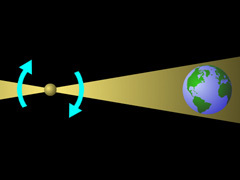 If the neutron star happens to be aligned so that the poles face the Earth, we see the radio waves every time one of the poles rotates into our line of sight. It is a similar effect as that of a lighthouse. As the lighthouse rotates, its light appears to a stationary observer to blink on and off. In the same way, the pulsar appears to be blinking as its rotating poles sweep past the Earth. Different pulsars pulse at different rates, depending on the size and mass of the neutron star. Sometimes a pulsar may have a binary companion. In some cases, the pulsar may begin to draw in matter from this companion. this can cause the pulsar to rotate even faster. The fastest pulsars can pulse at well over a hundred times a second. A pulsar is formed when a massive star collapses exhausts its supply of fuel. It blasts out in a giant explosion known as a supernova, the most powerful and violent event in the universe. Without the opposing force of nuclear fusion to balance it, gravity begins to pull the mass of the star inward until it implodes. 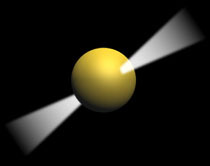 In a pulsar, gravity compacts the mass of the star until it forms an object composed primarily of neutrons packed so tightly that they no longer exist as normal matter. A physicist named Chandrasekhar Subrahmanyan theorized that if the mass of the core of the collapsing star was 1.4 times the mass of the star itself, the protons and electrons would combine to form neutrons in a neutron star. This number is known today as the Chandrasekhar limit. If this limit is not achieved by the collapsing core, a white dwarf star will be produced instead. If the limit is much greater, a black hole may be the result. As the star collapses, it begins to spin more rapidly in what is known as the conservation of angular momentum. The process is similar to that of an ice skater pulling their arms in close to spin faster. What is left behind is a rapidly spinning ball of tightly packed neutrons inside an iron shell. The extreme force of gravity would cause this shell to be extremely smooth and shiny. The resulting neutron star is only about 20 miles in diameter, yet is contains most of the mass of the original star it was formed from. The matter in this neutron star is packed so tightly that a piece the size of a sugar cube would weigh over 100 million tons on Earth. Pulsars are still found today by using large radio telescopes. The largest radio telescope in world is located at Arecibo in Puerto Rico. It has been a key tool in the search for pulsars. Several new pulsars have been discovered in the past few years. The famous Crab Nebula (M1) has a pulsar inside it. The nebula is the shell of gas that was exploded out in a supernova when the pulsar formed. The pulsar illuminates the nebula as it pulses at a rate of 33 times per second. Recently, the 1000th pulsar was discovered in Australia using a new radio telescope technology known as a multibeam receiver system. This device allows radio telescopes to scan the skies with up to 13 beams at the same time. Today, new pulsars are being discovered at ten times the rate they were in the 1970s and 1980s. Pulsars make incredibly accurate timekeepers. Their pulses are so consistent that they can be used to tell time with an accuracy much greater than atomic clocks, which are currently the most accurate timekeeping devices on Earth. The fastest know pulsar, known as PSR1937+21, has a pulse period of over 1.56 milliseconds, or 640 times per second. The strongest pulsar found so far is known as PSR 0329+54. It has a very slow pulse period of only 0.715 seconds. Some recently discovered pulsars, such as PSR 1257+12, are believed to have planets orbiting them.